Huawei has a new flagship smartphone line, the Mate 20 series. One of them is the Mate 20 Pro. Arguably, it is more impressive than what you will find from other mobile brands. How and why? The Mate 20 Pro is a HUGE upgrade coming from the Mate 10 Pro and P20 Pro. First, it has a brand new stylish design, Second it goes with a 7nm Dual AI chip. Third, you will find a lot of features that you might not see from any other flagships. It include the new triple Leica camera system with ultra wide-angle lens, massive 4,200mAh battery with 40W SuperCharge tech, reverse wireless charging, 4G LTE Cat 21 connectivity, NM card, and more. Based on those traits, this device is a game changer. How true is that? Is it the best in the world today? Here's our review part 1, unboxing and first impressions. 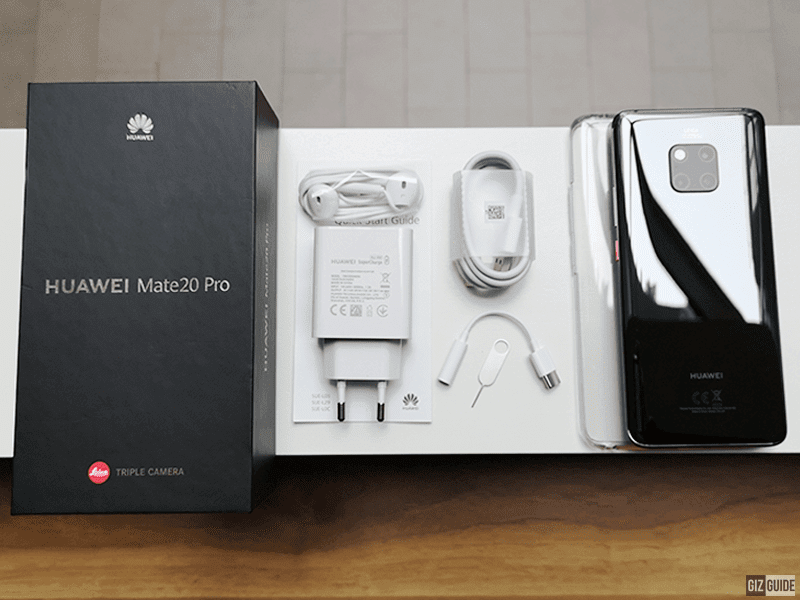 Like most Mate series phones, the Mate 20 Pro arrived in a premium looking black box. We just noticed that it is a rectangular box instead of the squarish box of the Mate 10 Pro last year. But, that isn't really that important. What matters the most is what's inside. First, you will find the large power brick. It is a special type of charger dubbed as the SuperCharge with 10V/4A or 40W output. 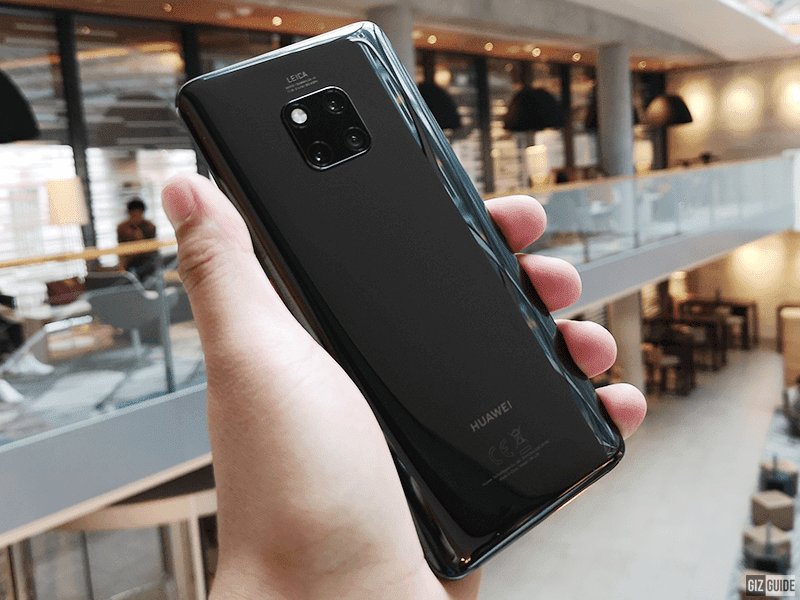 Huawei claimed that it can charge the the Mate 20 Pro up to 70 percent in just 30 minutes. Obviously, we will still test if it is true! I'm excited about it! Next on the box are the usual USB Type-A to USB Type-C data/charging cable, USB Type-C earpods looking earphones with microphones, and a SIM ejector tool. Fortunately, Huawei is still generous enough to still include a USB Type-C dongle. Sadly it has no 3.5 mm headphone slot. So, dongle is life. It still has a free case to prevent damages from accidental drops. The rest of the paper documents like the quick start guide and warranty card are also inside. What's missing in the package is a protective film for the screen. It is present in the likes of the P10 Plus of 2017. It is a minor thing though. Maybe, I'm just asking for too much. Excellent craftsmanship! The unit I got has the same metal and glass materials found on the P20 series, but refined. The frame feels very sturdy and the 3D curved back and front are made out of premium looking glass. It has some sort of glass protection, but unspecified. From my personal experience with Huawei devices, they are not that prone to fingerprint scratches unless you scratch it on purpose. The Mate 20 Pro should be fine as long as you have a pre-installed case. Note: You can also get the underwater case of Huawei for underwater photography. Oh by the way, Huawei upgraded the IP67 water and dust resistance of the P20 Pro to IP68 with the Mate 20 Pro. It means that you can submerge it in 2 meters deep water in 30 minutes without damage. Looking at the design, Huawei have outdone themselves once more. To my eyes and personal preference, it simply looks better than the P20 Pro. It reminds us of a refined Galaxy Note9, iPhone XS, and P20 Pro combined. It now has the curved glass of Samsung flagship phones. The most beautiful Huawei yet, no doubt! The new LEGO-like camera placement to house the triple-camera setup and the flash in the middle of the back part of the phone also looks good in general. For the luckier ones, there's a chance that the Mate 20/Pro you will get is the emerald green or midnight blue variants. Those are the models with textured glass back design that is not prone to fingerprint smudges. The Mate 10 Pro last year is slimmer at 7.9 mm versus the 8.6 mm of the Mate 20 Pro though. However, the Mate 10 Pro last year doesn't have wireless charging, 3 cameras at the back, and a bigger 4,200mAh battery. It is a minor thing. 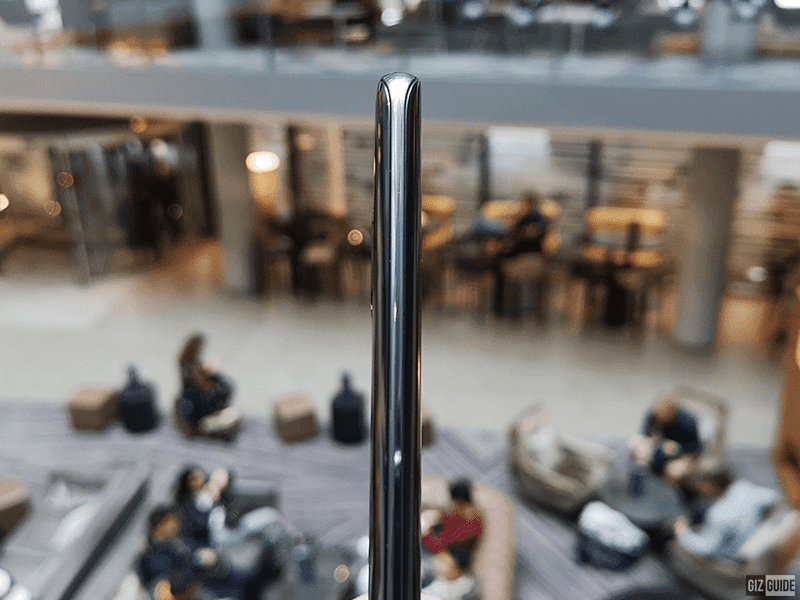 Besides, the Mate 20 Pro this year looks small despite having a 6.39-inch screen compared with the 6-inch screen of the Mate 10 Pro last year. It measures at just 157.8 x 72.3 mm. In comparison, the Galaxy C9 Pro of 2017 with smaller 6-inch screen has a bigger body which measures at 162.9 x 80.7 mm. Huawei made it possible by putting a taller 19:5:9 screen ratio with impressive 87.9 percent of screen-to-body ratio. It has very slim side bezels and small top and chin bezels. 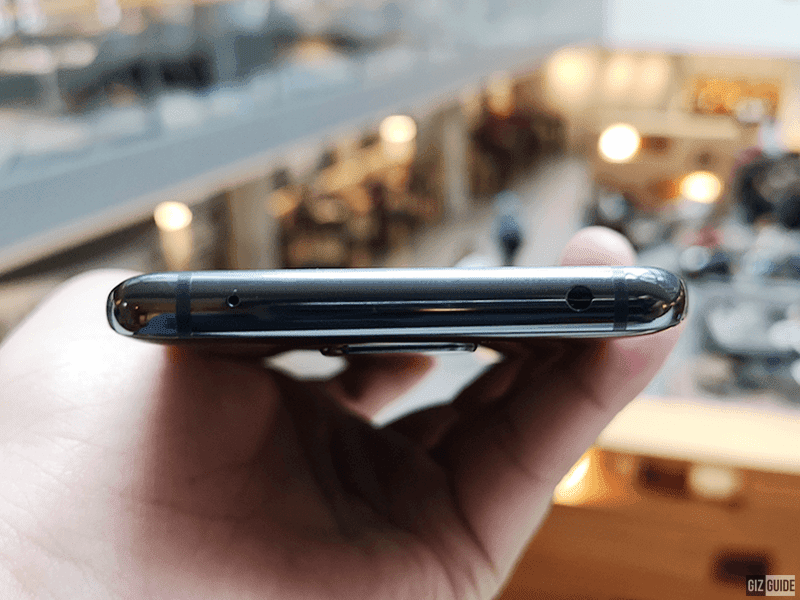 The notch is a bit wider than the P20 Pro to house more sensors in it. 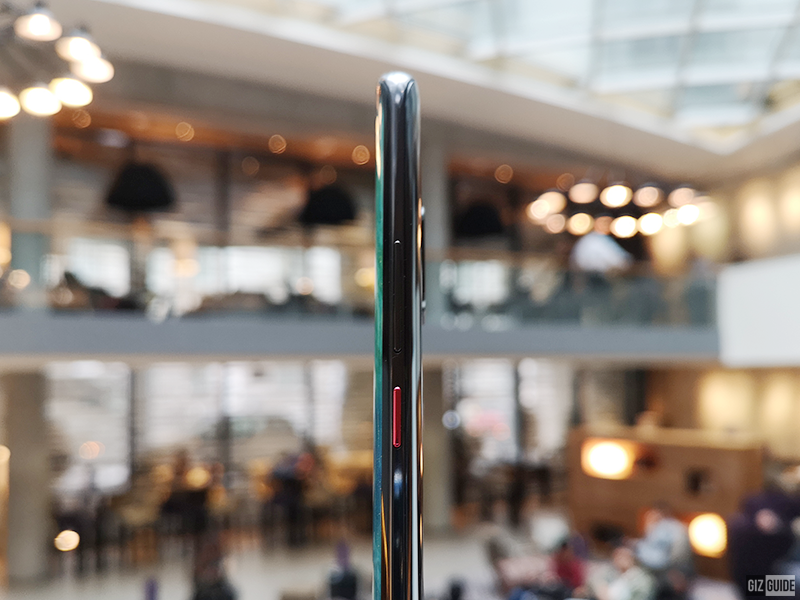 Fortunately, it is still slimmer than the notch of the iPhone XS and Pixel 3 XL. Those who do not like the notch can switch it off in the display settings. I also like that the phone has familiar ports and button placements. You will find an IR Blaster and a mic on the top, nothing at left, and power button/volume rocker at right. Below, you will see another mic, USB Type-C port, hybrid dual SIM/NM card slots, and the third mic. Where's the speaker though? It is cleverly hidden somewhere below. There's a secondary speaker to let you enjoy stereo audio found on the earpiece on top. If you can notice, we mentioned the NM slot. It is for the Huawei developed nano memory card which is just as small as a nano SIM. We just do not know yet if that tech will fly or not. But, we like the idea of it. 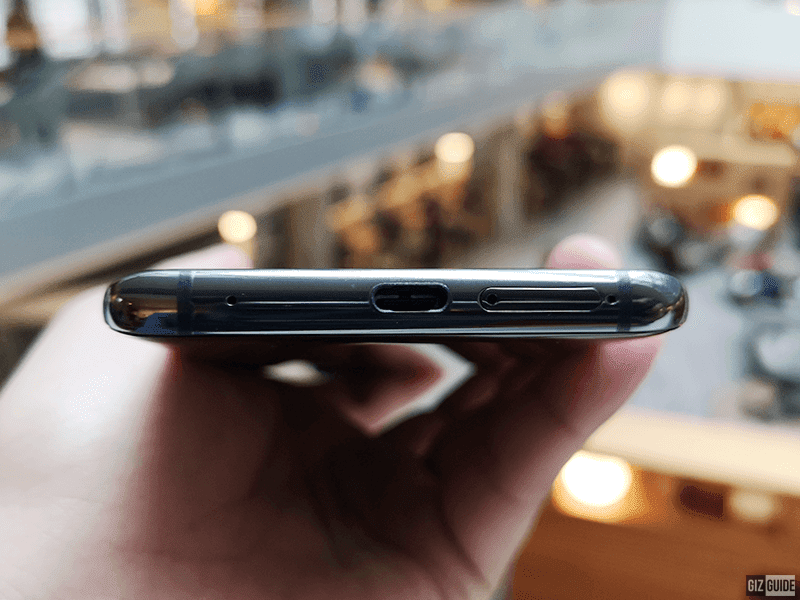 As usual, my only major gripe is the lack of a 3.5 mm headphone slot. In general, this is a piece of engineering marvel for me. It feels premium and functional at the same time. 1. No doubt, build is flagship grade! Arguably, the design is a bit above than the competition from Samsung and Apple. Moreover, it has a brand new 6.39-inch 3D curved OLED screen with QHD+ 3140 x 1440 resolution at 541 ppi. It has DCI-P3, HDR10, and over 800 nits of brightness as well. Ver impressive! 2. 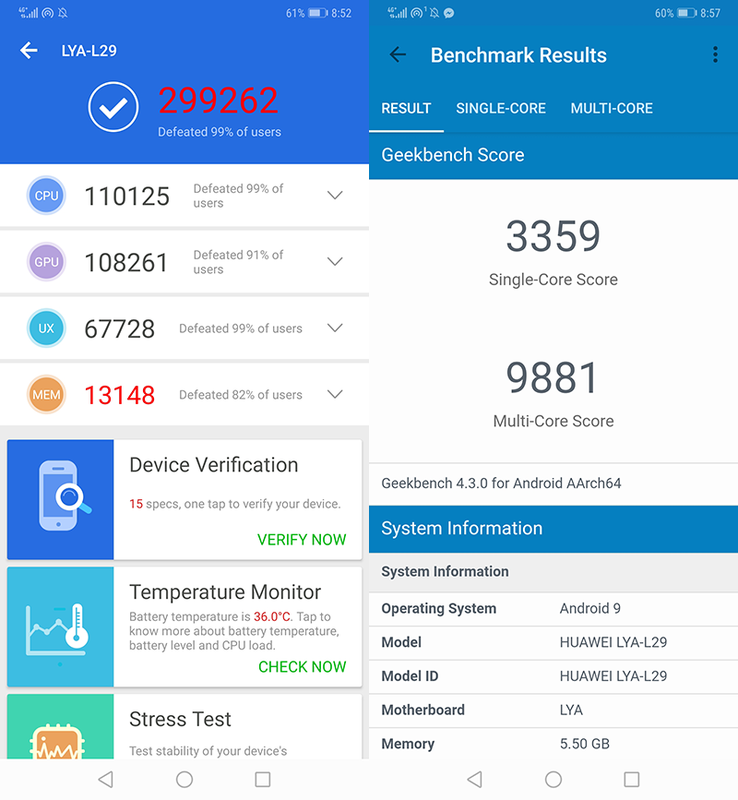 In terms of specs, it has the best processor found on Android phone yet. It runs with the Kirin 980 octa-core processor which is built under the 7nm process. The other phones with a 7nm chip are from Apple, the iPhone XS/XS Max, and XR. That chip is simply a beast. It is made out of 6.9 billion transistors in total. It also has a Mali-G76 MP10 GPU with GPU Turbo technology for much better gaming, Dual-NPU for faster AI recognition, the highest 4G LTE Cat 21 connectivity, and more! Moreover, this phone has at least 6GB RAM and 128GB of storage. It has a bigger 4,200mAh battery as well. That battery size is simply bigger than all 2018 flagship phones yet. Battery life is extremely long and charging time is blazing fast so far. I will share the exact results on our full review next week. By the way, it now has 15W wireless charging behind. It is also the first phone that you can use to charge other phones with Qi wireless charging standard like the new iPhones. 3. This is one of the first non-Pixel flagship phone with Android 9.0 Pie out of the box. It is paired with the heavily skinned EMUI 9.0 (in a good way) on the top. This is the neatest version of EMUI yet. As expected, it has tons of useful features and AI functionalities like the translation, calorie counter, and scene recognition. It even has a 3D scanning feature which can turn a stuff toy into a controllable 3D object. It is more integrated with Google as well. You can even now have the choice to switch from performance mode (faster performance) or regular mode (regular performance with better battery efficiency). 4. 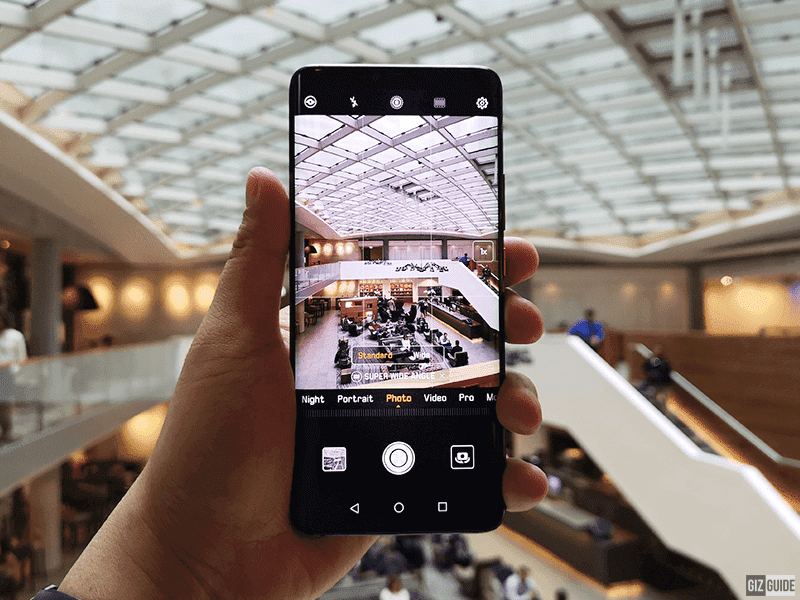 The triple-camera system of the P20 Pro is a tough act to follow. 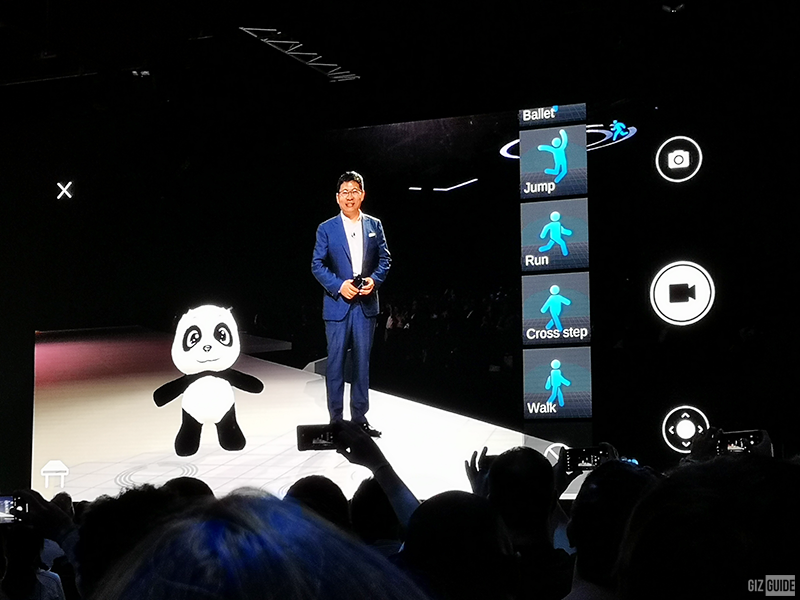 But, Huawei made sure that they can top it with the Mate 20 Pro. It is their most versatile camera system yet. It now has an ultra wide-angle camera too. Zoom is better as well. Stabilization for videos are incredible even on 4K and 4K wide-angle mode. The exact triple-camera setup include a 40MP f/1.8 27 mm sensor with with 1/1.73-inch size, 20MP f/2.2 16 nm ultra wide-angle lens, and an 8MP f/2.4 3x telephoto lens with OIS. They have 4D predictive focus, AIS, 5x zoom, 4K video recording, 960 fps slow motion, and dual-tone LED flash. The 24MP f/2.0 selfie shooter has less aggressive face beauty mode as well. See the link of our samples below. 5. This device has the fastest In-Display fingerprint scanner we tested yet. Yes, it is way faster than the ones found on the Vivo V11 and X21. The 3D face unlock tech is as fast as the OPPO Find X too. WiFi and 4G LTE are the best as expected. It even now has a dual-band GPS for more accurate location and tracking. The stereo speaker setup of my unit is a bit weaker than the stereo speaker of the P20 Pro. Maybe, that's the trade-off of having a better IP68 water and dust resistance. Fortunately, it still has the IR Blaster that you can use as a remote control for your TV and more. The Mate 20 Pro is easily the best of Huawei that I ever tested yet! The out-of-box experience is incredible. Huawei flexed its R&D muscles even harder this time. It has a stunning build/design, blazing fast performance, extra big battery capacity, an improved camera system, and a lot of other cool tricks under its sleeves that we will cover in our full review. 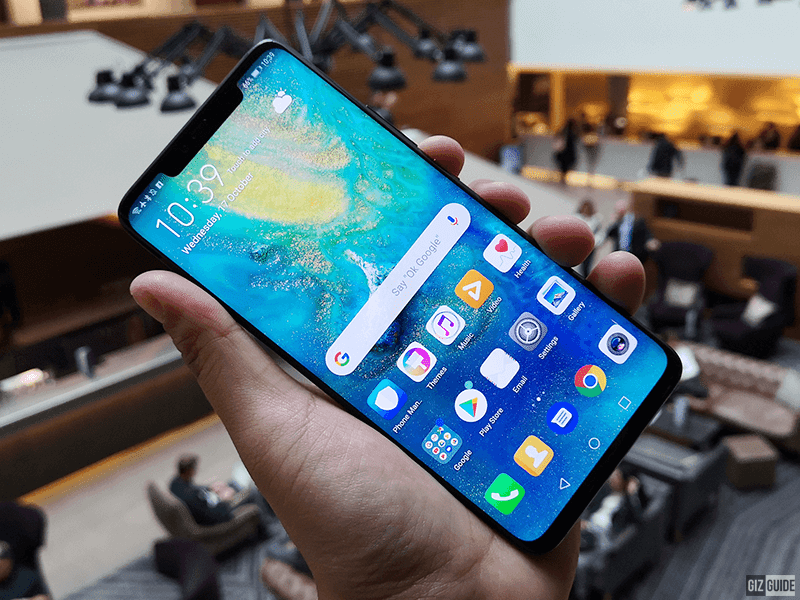 See also: Huawei announces Mate 20 series pre-order and pricing details in the Philippines! We will reserve our judgment in our full review, but so far, the Mate 20 Pro is synonymous to the word incredible. For our review: Huawei Mate 20 Pro Review - Best of 2018!